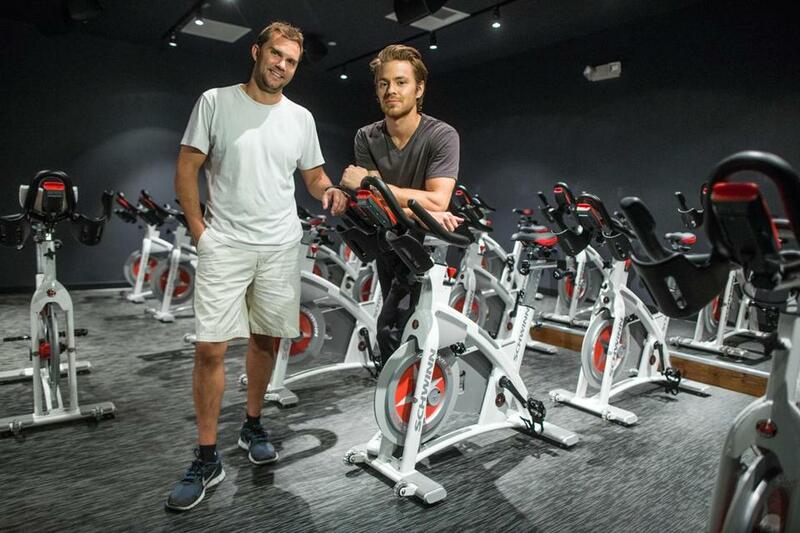 Cofounders Ryan Olsen and Mark Partin are set to open B/SPOKE indoor cycling studio next week on Federal Street in the Financial District. The peloton in Boston is growing. Yet another indoor cycling studio is opening in the city, bringing a taste of the steep hills and grind of an outdoor road race to a downtown office building. Set to open July 7 on Federal Street, B/SPOKE would be at least the eighth indoor cycling studio to open in Boston in the last three years. Though it is an old form of fitness, indoor cycling is booming again And this new generation of studios is pitching its high-intensity, quad-busting classes as more physically and socially rewarding than a solo workout at a typical gym. Perhaps because of the echoes to spinning classes, this generation of indoor cycling studios typically draw a female-heavy clientele. But Partin and B/SPOKE cofounder Ryan Olsen are shooting for a mixed crowd, going so far as to carefully design a motif for their studio that they call, “industrial Zen,” with blackened steel and reclaimed wood, to make male riders feel comfortable. Like the other studios, B/SPOKE plans to charge $20 to $27 for 45-minute classes, with longer classes for more hard-driving riders. The workout is pretty straightforward: dim the lights, crank the music, and pedal until your legs are sore. Partin and Olsen spent the past 18 months working on B/SPOKE, and said their market research convinced them there is strong demand for the studio in downtown Boston. Moreover, Partin believes indoor cycling studios are not a fad, and not only will endure, but distinguish themselves from large gyms that happen to have stationary bikes. “What I would liken it to,” Partin said, “is the growth you’ve seen in yoga studios,” which continued to thrive even after the big gym chains offered their own yoga classes. 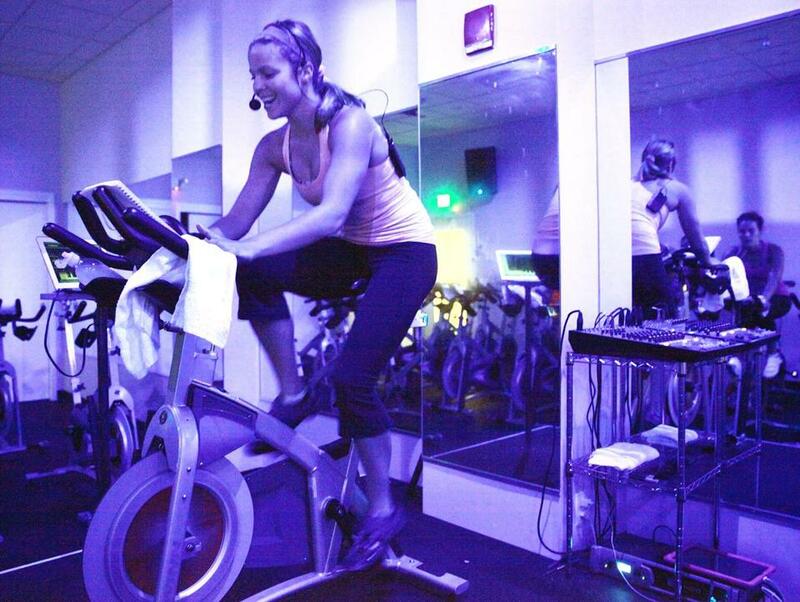 Instructor Jessica Bashelor led a class at the Handle Bar, one of about eight indoor cycling studios in Boston. Before going into business together, Partin and Olsen worked in the finance industry in New York, where each took up cycling to recover from injuries. Although they enjoyed the classes, Partin said the studios where they worked out didn’t quite strike the right tone for them. So in 2013, they decided to open their own studio, in Boston, where Olsen grew up and Partin went to college. “We had always kicked around the idea the year before, but it takes one thing to talk and another to come on and do it,” said Olsen. Classes will begin at 5 a.m, and B/SPOKE will offer two lunch-hour classes as well. The studio also has six showers stocked with Aesop skin care products, so riders can clean up before heading into work. The pair declined to disclose how much they have invested in the studio, but they are already contemplating an expansion, as well as launching a line of branded activewear and casual clothing. But Partin said SoulCycle’s glam approach isn’t for him.